To win some much-needed attention in the Side-By-Side ATV market, the 2015 Honda Pioneer 500 will be the first vehicle of its type to come with a paddle-shifted electronic transmission. Honda has been stalled at "also ran" status in the Side-By-Side scene, cowering in the shadow of industry-dominating entries from Polaris and Yamaha. 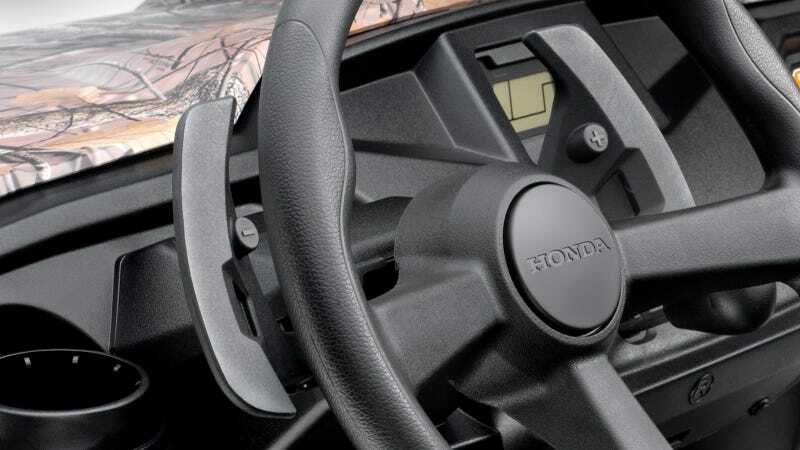 But if these flappy paddles turn out to be fun to use, and not just a goofy gimmick you're going to forget about, they might be the ticket to buy Honda more market share. The clutch is automatically activated with five forward speeds, "first" being "low." I'd be a little worried about knocking into them off-road... Side-By-Side rides are really bouncy. The 2015 Honda Pioneer was designed at the company's Ohio R&D facility, and will be built in Timmonsville, South Carolina. The ATV is 50" wide with a 73.1" wheelbase, giving it a 13' turning radius. It's also got a trailer hitch receiver and the cutest little cargo bed you ever did see! Engine's a 475cc four-stroke one cylinder fed by a 5.2 gallon fuel tank. The whole thing weighs 1010 pounds and it can tow another 1,000. The Pioneer rides on independent double-wishbone suspension, with 5.9" of travel in the front and rear.